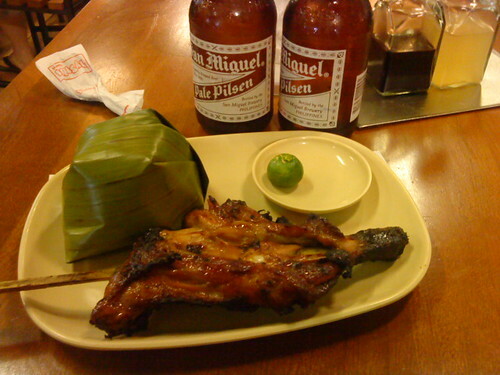 Like almost every chicken dish (yes, tinola included), chicken inasal is beer food. It’s not because I’m a drunkard, but many alcoholic drinks serve to enhance and stimulate the taste buds rather than dumb them down. Hence the habit of many frou-frou restaurants to serve apertif and digestif; sensitizing the palate and the tongue. Chicken is best served with beer, but even the coldest (watered-down) bottle(s) of San Miguel Pale Pilsen wasn’t enough to save a dish that was too marinated, too sweet, and too artificially caramelized. Fast service is a plus at Mang Inasal, though, although you expect that same speed from fastfood restaurants. I have to give it to the chicken, if only I ordered chicken tocino, that is. Giant shiny gas grills are no delights for fans of authentic Pinoy cooking, since the skin of the chicken had the faint flavor of butane (don’t ask me how I know the flavor). The best point of comparison I can think of is a couple of plates of inato I had in Dumaguete, which were cooked in giant coal grills. You can taste the difference; while chicken cooked in a giant gas grill is more evenly-cooked (to the point of burnt cartilage and blackened bones), the bit of juice left in coal-grilled chicken adds more… character, to the meat. Here’s where this serving of pa-a fails; the caramelization and flavoring is so strong that I had to dip everything in a lot of white vinegar to cut the sweetness. I should have had dessert (OK, I don’t usually eat dessert) and a few more skewers of giblets, but for P168.00, you really can’t do much with it. Fastfood inasal, represented here by Mang Inasal, fails in the same way that Andok’s and Baliwag did when it comes to litson manok: too much flavor, too little chicken going on. About the only thing going for this restaurant, as far as I’m concerned, is that it’s great for the occasional inuman if you’re in the mood for drinking at a mall. Methinks a trip back to Negros is in order. Growing up in the city where inasal was popularized, my taste buds were first accustomed to the basic chicken barbecue recipe offered by no-frills establishments that made up the complex known as Manukan Country. During the late 80s, people in Bacolod got concerned of increasing beer bottle-smashing, knife-wielding incidents in the complex, so standalone, family-friendly inasal joints far from Manukan Country picked up. Competition among them improved the quality of what they have to offer: juicier meat, bigger portions, better ambiance, lower price, and greater taste. The last attribute was the most important as it made or broke an inasal restaurant business. For the entire 90s, demand dictated taste’s direction and It was mostly into lightly soy sauce salty territory with strong hints of garlic and chicken oil. Dip was almost mandatory, as it provided the missing tastes of subtle sweet-and-sourness through the perfect mixture of soy sauce, spiced vinegar, and calamansi. Then came Mang Inasal, a Bacolod outsider, both in terms of business origin and recipé. Bacolod people were skeptical when it opened its first few branches, but the unlimited rice deal was hard to resist. The sweet, chicken tocino taste quickly conquered the inasal capital. Was it inasal-taste fatigue? Maybe. I like Mang Inasal too but yes, I still go for the authentic Bacolod-style inasal. Chicken House along Visayas Avenue, anyone? Or Chicken Bacolod? Congratulations, Maro, for hitting a bull’s-eye in your first food blog post! Most people are just too lazy, the reason why these fastfood pretenders become successful. Another reason is that great mom and pop establishments like tatoy’s in Iloilo are often inconsistent about their food, their main weakness. Fastfood’s greatest weakness, and here they’ll even beat the best fancy restaurants in the world, is consistency of taste and portions. I have a favorite rib place. It’s located in a mall but it’s very cheap. A few days ago, I had to return the plate because the ribs were all bone–they gave me the portion near the chest bone. It was a small thing, and probably an honest mistake, and they replaced it with a better plate, but to me it was totally shocking. I go there at least once a week but now I feel I’ll skip going for a couple of months and order from Kenny Roger’s or Outback instead. Men you got it all wrong if you “mean” original Inasal = to Bacolod Style. Inasal is a Western Visayas area receipe, and Iloilo has one too so as Dumaguete. But Bacolod made it famous. I’ve been eating Inasal since I’m a kid in the 70’s in my Iloilo Hometown. And beside inasal is a Karay-a word that came from Panay.